Washington – Today, Congressman Steve Chabot (R-OH), Ranking Member of the House Small Business Committee, released the following statement in response to the Department of Labor’s December 2018 jobs report. To read the full report from the Department of Labor, click here. Washington – Today, the House of Representatives passed the final version of H.R. 88, the Retirement, Savings, and Other Tax Relief Act and the Taxpayer First Act. Key provisions of this legislation would significantly benefit American small businesses. Whether it is through assisting business owners with providing employee retirement plans or redesigning a more taxpayer friendly Internal Revenue Service (IRS), this legislation is another step by Congress to spur economic growth and modernize the tax code. With the one-year anniversary of the historic Tax Cuts and Jobs Act just a few days away, the House of Representatives remains focused on creating a streamlined and reliable tax code on which American entrepreneurs can rely. WASHINGTON – Today, the National Federation of Independent Business (NFIB) released its November 2018 Small Business Optimism Index, which reports optimism remaining high in November. WASHINGTON – Today, the latest quarterly Wells Fargo/Gallup Small Business Index was released, indicating a significant jump of optimism among small business owners and the highest score in the survey’s 15-year history. 80 percent of respondents regarded their financial situation as very good or somewhat good. 55 percent of respondents recorded increases in revenue for their small businesses. 27 percent of small business owners say over the past 12 months, the number of jobs in their company has increased. 47 percent of companies found it somewhat or very easy to obtain credit. WASHINGTON - Today, House Committee on Small Business Chairman Steve Chabot (R-OH) and House Committee on Veterans’ Affairs Chairman Phil Roe, M.D. (R-TN) released statements following the introduction of new legislation to better enable the Small Business Administration (SBA) and Department of Veterans Affairs (VA) to fulfill their designated responsibilities and streamline programs within the agencies. H.R. 7169, the Verification Alignment and Service-Disabled Business Adjustment (VA-SBA) Act was introduced by the House Small Business Committee’s Chairman of the Subcommittee on Investigations, Oversight, and Regulations Trent Kelly (R-MS). Currently, SBA certifies small businesses that participate in federal contracting preference programs. However, Service Disabled Veteran Owned Small Businesses (SDVOSB) are the exception – they are verified by VA to qualify for VA contracts, and are uniquely allowed to self-certify through SBA to obtain federal contracts from all other federal government agencies. The ability of SDVOSBs to do so has led to years of fraud, waste, and abuse, as it has allowed companies not owned by service-disabled veterans to take advantage of the system. It also has created two separate classes of SDVOSBs: those that are verified by VA, and those that have self-certified at SBA. The VA-SBA Act would require SBA to certify all SDVOSB applications, as it does for all other small businesses, and would preserve the unique Veterans Owned Small Business contracting preference in VA.
"This legislation is the result of a close partnership between our two committees," said Rep. Bergman. "Chairman Kelly and I convened a joint oversight hearing to study the issue in July, and after months of consultation with the veterans service organizations, the veteran small business community and the agencies, the VA-SBA Act is a sound solution,” said Bergman. “It will make the federal government operate more efficiently and logically by instituting badly needed safeguards in the SDVOSB contracting program. Every contract that gets siphoned off by a fraudulent company denies a service-disabled veteran entrepreneur a contracting opportunity that he or she earned. The loophole that allows this to happen must be closed." WASHINGTON – Last week, House Committee on Small Business Chairman Steve Chabot (R-OH) penned an op-ed in Fox News on the value of Small Business Saturday to communities and entrepreneurs. Read the full op-ed below. Serving as Chairman of the House Committee on Small Business over the past four years, I’ve had the honor of advocating and fighting for Main Street. This year on Small Business Saturday, November 24, 2018, I hope Americans will celebrate the 30 million small businesses and the millions of workers they employ by shopping locally. This day is an incredible opportunity to support our local independent businesses during their most critical time of year. In 2010, the Small Business Saturday campaign was launched to help small businesses that were hurting from the recession by boosting sales and encouraging shopping. Every year since 2011, both chambers of Congress have introduced resolutions to recognize and promote Small Business Saturday as the Saturday after Thanksgiving. This year, I had the privilege of introducing a resolution to continue this tradition and recognize November 24, 2018 as Small Business Saturday, and support efforts to increase awareness of the value of locally owned small businesses. This day gives us an opportunity to refocus our efforts and reaffirm our commitment to helping small businesses thrive. With 99 percent of all employers in the United States being small businesses, it’s critical we fuel this engine of job creation and innovation. By shopping small, Americans can stimulate our economy and support the two-thirds of net new jobs that small businesses produce. In Ohio alone, there are 944,797 total small businesses that employ 2.2 million people, according to the Small Business Administration’s (SBA) most recent data. With American Express reporting that 90 percent of consumers say that Small Business Saturday has had a positive impact on their community, can you imagine the impact this day has had on Ohio alone? And, the impact that Small Business Saturday can have throughout our nation is huge. The 2017 Small Business Saturday Consumer Insights Survey from the National Federation of Independent Business (NFIB) and American Express highlights this impact. The survey notes that last year, 108 million shoppers spent $12.9 billion at a variety of businesses, from restaurants to clothing stores to coffee shops, on Small Business Saturday. When you reflect on these numbers, there is nothing ‘small’ about small business. In my 22 years serving on the Small Business Committee, I’ve seen first-hand the hard work and dedication small business owners put into their companies to get them off the ground and succeed. The Committee has held hearings and roundtables to hear from entrepreneurs and talk through the joys and challenges of running a business. It has always been the mission of the Committee, as it must be for Congress, to offer solutions that will help grow businesses. Further, the Committee has been working diligently with the Administration to reduce regulatory costs and burdens. In fact, for every new regulation issued, the Administration has eliminated 12, resulting in $33 billion in net regulatory savings over the last two years. American business owners should be investing in the American Dream, not squandering their resources on regulatory compliance. To help amplify this effort, the Committee has an online resource called Regulatory Watch. This resource is for small businesses that want to participate in the regulatory development process, but do not have the time or ability to monitor federal agencies’ activities. The webpage is updated regularly to highlight proposed regulations that could impact small businesses, allowing owners the opportunity to submit comments, plan ahead, or simply better understand the process. Fortunately for Mr. Wiederhold, our economy is on the uphill swing, with unemployment at an all-time low and small business optimism setting record highs. This past June, President Trump signed the Small Business 7(a) Lending Oversight Reform Act, a bill I introduced to ensure appropriate oversight of the SBA’s flagship loan program and improve access to capital for small business owners. Getting a loan for a small business can be the difference between expanding their company and creating jobs or never getting off the ground. This was a huge win for small businesses and the workers they will hire because of it. It’s important that we do all we can to help America’s entrepreneurs who not only dare to dream but dare to make those dreams a reality. On Small Business Saturday, I encourage you to get involved in your community, whether you are in Carson City, Nevada, or Cincinnati, Ohio – my hometown – and shop small. Your support allows small business owners to continue to dream big, take risks, and drive innovation for the next generation of Americans. 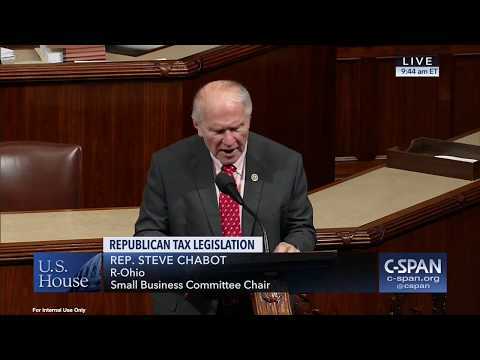 Republican Steve Chabot represents Ohio's 1st congressional district in the U.S. House of Representatives where he serves as chairman of the Small Business Committee. WASHINGTON – Today, House Committee on Small Business Chairman Steve Chabot (R-OH) released the following statement in recognition of November 20, 2018, as National Entrepreneurs’ Day. WASHINGTON – Today, House Committee on Small Business Chairman Steve Chabot (R-OH) released the following statement in recognition of National Veterans Small Business Week; November 5-9, 2018. According to the United States Small Business Administration, there are 2.5 million veteran-owned small businesses in the United States, with a 3 percent growth from 2007-2012. This Congress, Chairman Chabot is an original co-sponsor of H.Res. 588, which supports National Veterans Small Business Week. 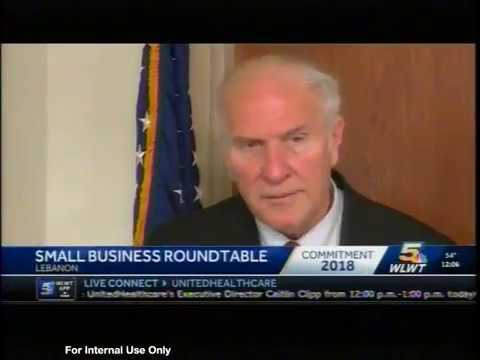 WASHINGTON – Today, House Committee on Small Business Chairman Steve Chabot (R-OH) released the following statement after the United States Department of Labor announced an additional 250,000 jobs were added in October. POSTPONED 21st Century Telecom: Is the FCC Addressing Small Business Concerns? The Committee on Small Business hearing titled, “21st Century Telecom: Is the FCC Addressing Small Business Concerns?” has been postponed. The Committee on Small Business Subcommittee on Economic Growth, Tax, and Capital Access will meet for a hearing titled, “The Local Impact of Economic Growth.” The hearing is scheduled to begin at 10:00 A.M. on Thursday, September 27, 2018 in Room 2360 of the Rayburn House Office Building. The Subcommittee will examine how the recent economic expansion is affecting minority-owned small businesses. This hearing will have a particular focus on how regulatory and tax changes have renewed small business optimism and benefited small business owners. The Committee on Small Business Subcommittee on Contracting and Workforce will meet for a hearing titled, “Troubled Skies: The Aviation Workforce Shortage's Impact on Small Businesses.” The hearing is scheduled to begin at 10:00 A.M. on Wednesday, September 26, 2018 in Room 2360 of the Rayburn House Office Building. The purpose of this Subcommittee hearing is to examine the pilot and mechanic shortage in the aviation industry, in the context of small businesses. A confluence of factors has led to a widening gap between pilots and aviation mechanics leaving and entering the workforce. While the shortage has been widely documented and covered by business experts and journalists, the impact to small businesses operating as part of this pipeline remain unexamined. The hearing will allow the Subcommittee to receive testimony on the negative effects of this aviation workforce shortage on small businesses across the country and identify potential solutions that may help reverse this decline. The Committee on Small Business will meet for a hearing titled, “Now Hiring: How the Opioid Epidemic Affects Small Businesses.” The hearing is scheduled to begin at 11:00 A.M. on Thursday, September 13, 2018 in Room 2360 of the Rayburn House Office Building. The hearing will explore the effects of the opioid crisis on small businesses. Specifically, the hearing will examine the decline in the labor force participation rate due to the epidemic and the challenges that small businesses experience in finding qualified workers as a result. The Committee on Small Business will meet for a hearing titled, “Surveying Storms: A Deeper Dive into SBA’s Disaster Response.” The hearing is scheduled to begin at 11:00 A.M. on Wednesday, September 5, 2018 in Room 2360 of the Rayburn House Office Building. This hearing will examine the United States Small Business Administration’s (SBA) disaster response. Members of the Committee will hear directly from the SBA regarding the agency’s actions during the 2017 storm season and SBA’s disaster response moving forward. The Committee on Small Business will meet for a hearing titled, “The Tax Law's Impact on Main Street.” The hearing is scheduled to begin at 11:00 A.M. on Wednesday, July 25, 2018 in Room 2360 of the Rayburn House Office Building. The hearing will examine how the Tax Cuts and Jobs Act has affected small businesses. Members of the Committee will hear directly from small business owners regarding the impact the law has had on their operations and their outlook moving forward. The Committee on Small Business Subcommittee on Economic Growth, Tax, and Capital Access and the Subcommittee on Agriculture, Energy, and Trade will meet for a joint hearing titled, “Investing in Rural America.” The hearing is scheduled to begin at 10:00 A.M. on Tuesday, July 24, 2018 in Room 2360 of the Rayburn House Office Building. Access to capital is one of the key ingredients for small business success. Early stage funding such as venture capital can help small businesses expand and hire more individuals in their community. However, venture capital is predominately awarded to businesses in larger cities on the coasts. Various groups, including public-private partnerships, trade associations, and university based organizations, have emerged to help identify opportunities for private investors that support growing rural small businesses across the United States. This hearing will examine venture capital’s role in helping small business to access capital, and provide success stories of organizations that provide resources to small businesses in rural America. Click HERE to view the official markup notice. Watch the hearing live here. The Committee on Small Business Subcommittee on Investigations, Oversight, and Regulations and the Committee on Veterans’ Affairs Subcommittee on Oversight and Investigations will meet for a hearing titled, “Achieving Government-Wide Verification of Service-Disabled Veteran-Owned Small Businesses.” The hearing is scheduled to begin at 2:00 P.M. on Tuesday, July 17, 2018 in Room 2360 of the Rayburn House Office Building. This hearing will examine the progress of the Department of Veterans Affairs (VA) and the Small Business Administration (SBA) in harmonizing definitions related to service-disabled veteran-owned small businesses (SDVOSBs). The hearing will also examine SBA’s readiness to assume the remaining verification functions from the VA’s Center for Verification and Evaluation and the benefits of extending verification of SDVOSBs government-wide. The Committee on Small Business will meet for a hearing titled, “Innovation Nation: How Small Businesses in the Digital Technology Industry Use Intellectual Property.” The hearing is scheduled to begin at 11:00 A.M. on Wednesday, July 11, 2018 in Room 2360 of the Rayburn House Office Building. Digital technology allows small businesses to sell their products and services all over the world. Not only does digital technology benefit small businesses by lowering their operating costs, developing market automation, and improving customer relationships, but small businesses can expand by entering the digital technology industry themselves. More than just taking advantage of digital tools to improve a pre-existing small business, small businesses are becoming the digital tools, and small businesses in the digital technology industry continue to emerge. While each company is unique, these small businesses have developed first and foremost because of their utilization of technology. As a result of their unique innovations, small businesses create intellectual property, but in turn face challenges in protecting their ideas. This hearing will examine how small business owners in the digital technology industry utilize intellectual property and the issues they face when navigating the intellectual property processes. "Now Hiring: How the Opioid Epidemic Affects Small Businesses." 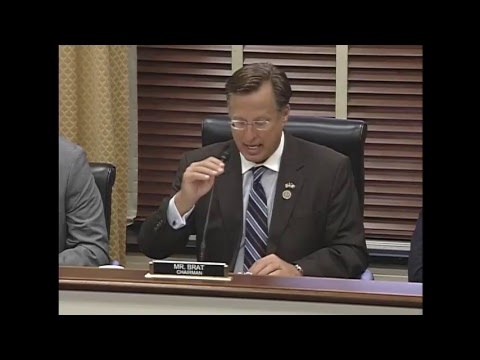 Hearing: "Surveying Storms: A Deeper Dive into SBA's Disaster Response"